Horse Speak™ is a practical system for “listening” and “talking” to horses in their language, instead of expecting them to comprehend ours. Horse Speak can be used by anyone who works with horses, whether riding instructor, colt starter, recreational rider, or avid competitor. It promises improved understanding of what a horse is telling you, and provides simple replies you can use to tell him that you “hear” him, you “get it,” and you have ideas you want to share with him, too. 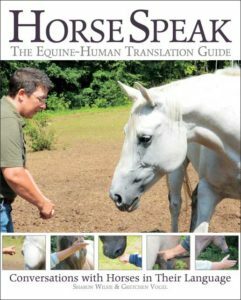 Sharon Wilsie, Creator of Horse Speak and Heidi Potter, Senior Horse Speak Instructor, have created the Horse Speak Education Program to take you beyond natural horsemanship to a much deeper understanding between you and your horse. You can learn to understand what your horse is saying to you and how to respond in a meaningful way. Heidi and Sharon are offering several opportunities for you to learn Horse Speak in 2019. This is Phase I of a 3-clinic series. Learn the fundamentals of Horse Speak through interactive exercises, herd observation and hands-on application. Bring your horsemanship to a new level by learning about horses’ incredibly subtle communication system and how you can offer a meaningful and appropriate response. The Phase II clinics are designed for those who have participated in a previous Horse Speak Phase I clinic or have gained Horse Speak experience through working with Sharon Wilsie or Heidi Potter. The Phase III clinics dive deeper into Horse Speak and require completion of Phase I and II. This 4-day clinic will take 8 lucky hands-on participants and an unlimited number of auditors through the entire Horse Speak Book. Sharon Wilsie has enjoyed a professional career as a horse trainer/rehabilitator, Intercollegiate coach, and riding instructor. Her love for horses has been life-long. 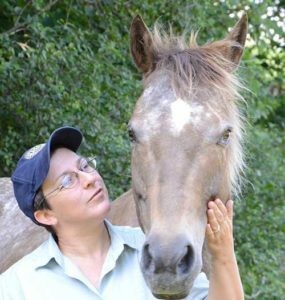 She is also a Reiki Master and has developed and implemented several programs over the last decade specializing in alternative training and rehabilitation methods for difficult horses and horses with PTSD. 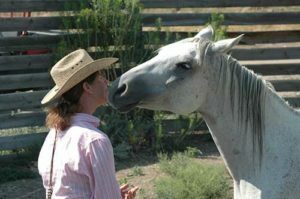 Heidi Potter is an internationally known and respected Trainer, Clinician and Instructor who specializes in improving relationships between horses and humans using compassion, self-awareness, understanding, patience, and praise. Ms. Potter teaches a wide variety of training and riding clinics at her Southern Vermont facility, The New England Center for Horsemanship and abroad.